Here’s a video review of the game Merchants by Reiner Knizia and published by Catalyst Game Labs. Enjoy! The third part of my lovely acronym MVP is the P…Persistence! 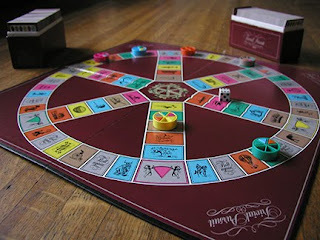 in 1981 Abbott and Haney sold 1100 copies of Trivial Pursuit and lost $60 on each of them. They stuck with their idea and 3 years later in 1984 they sold 20 million copies. Fortunately for Abbott and Haney they had a great game, and possibly more importantly they had persistence. They could have tucked their tails between their legs and counted their losses after 1981, but they believed in their game and stuck it out. In this business you have to be persistent. Sen and I started seriously designing board games in 2005 and it’s taken 5 years to get one game to market. Mind you we both have “real” jobs and have only been able to work on this in our spare time. In those five years we’ve submitted over 14 games 20 times to a variety of companies. So we’ve had our fair share of rejections. With only two of those games being published we’re only batting .100 so far. That’s actually a pretty decent average so far from what I’ve heard from other designers in the industry. Sometimes, if you’re lucky, when you get rejected from a publisher they will give you some feedback on why they don’t want it. Sometimes it’s things that you can’t do anything about – as was the case when we submitted our game Junkyard to Buffalo Games. They loved the game and kept it for a few months while they deliberated over it. They said it fit perfectly with the kind of games they like to publish. Unfortunately they ended up passing on the game because the components were made out of wood and they only had experience in making games with cardboard because they manufactured it themselves. Not much we could do as it was imperative that the game be made out of wood…or possibly plastic. However, sometimes you get feedback that can help your game! For our game Jungle Jam we were rejected by R&R Games because the scoring was too fiddly. They said that everyone enjoyed playing it but the parent playtesters were worried that the scoring bits would be lost. We were saddened of course, but after thinking about it we found a way to include the scoring onto the cards themselves thereby allowing us to remove the scoring pieces altogether! This game is now currently back out being shopped to other publishers. Adding scoring onto the cards! I look at rejection as a part of the process, but there are ways to reduce how much rejection you get, which I’ll get into in a future post! Just remember that if you believe strongly in your games, stick with it. Be cautious with how much of your own money you pour into it because you could lose it all – but as long as it’s only costing you time, keep with it! With every bit of feedback we get, not only does the game that got rejected get a bit better, but all of our games get better. Because we subscribe to an overall design ethic / aesthetic, many of our games have similarities, however subtle. So sometimes, when we get feedback that changes how we look at one game, it can possibly change how we look at some of our other previously designed games and it definitely affects how we proceed on current and future designs. To bluntly state “man, they don’t know what they’re talking about – our game ROCKS!” after getting the rejection letter is just being egotistical (even though many of our games do, in fact, rock ). It’s only through getting feedback that we can really improve our product and tailor it not only to gamers, but the publishers who have sometimes very different agendas (i.e. $$$) than the people who will end up playing the game itself. And so we must expose our work to constant criticism and feedback. It’s all in how we choose to view the responses, really. “We must learn from the past to change the future”. b) actually buy the game? For this scenario, let’s assume BGG.com doesn’t exist and this is the first time you’ve ever seen the game sitting on the shelf. Continuing with our acronym, let’s delve into the second letter. Another aspect I attribute my success to is having Versatility. 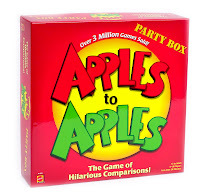 I like almost all types of games – party games, strategy/Euro games, word games, family games, video games. There are a few types of games I’m not interested in like military simulation or miniature wargaming or collectible card games (though I was a huge Magic geek back in the day). When Sen and I decided to make our own games, we didn’t really talk about this, but neither of us cared what kind of games we made – as long as they were good ones. Some of our ideas would be kid’s games and some would be serious “Gamer” games. Our goal was to get a game published – any game, so we made a ton of different games, in a ton of different genres. Being Versatile also went a long ways to keeping us motivated as I mentioned in my previous post. But there are even more benefits to being versatile. We had one game called Bertolt Lost his Marbles and was a kid’s game that had four animal characters running around a board picking up marbles and trying to avoid a troll. The game wasn’t working for us because it was just too many things going on for a kid’s game. This lead us to think that we should move this game into a more gamery game. Of course the theme didn’t make any sense any more so we changed it up. We changed the four animal characters into four wizard apprentices and the marbles were turned into Dragon eggs. The Troll was obviously turned into the Dragon and we now had ourselves a more gamery game called Night of the Dragon! We shopped it around (more on this in future posts), but it has yet to get picked up. 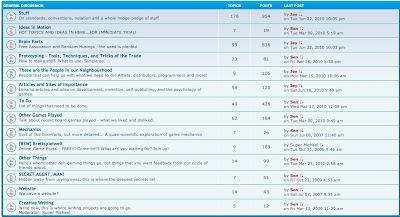 Years later I was working on a game design competition (the benefits of these will also be in a future post) for ToyVault’s release of the Piecepack game with another partner. Piecepack, if you’re not in the know, is a specific set of components that can be used to make any number of your own games. Since every game uses the same components, the games are often more abstract and less themey. We were stuck on a design for this competition and eventually I thought of Night of the Dragon. We borrowed the movement mechanic from that game and fit it into this Piecepack game. It worked perfectly and this game, called Cream of the Crop, won the competition and is coming out in the latter half of 2010. By being Versatile we were able to leverage our ideas and use them in other genres and styles of games. Think about your game ideas currently. If you’re stuck on one of your ideas, maybe it’s in the wrong genre and you should try seeing if the mechanics would be better suited elsewhere. I like to credit my success to this acronym: MVP. Seems like any good “How To” Blog needs to have an acronym! So what do you need to do in order to be an MVP? This post is about Motivation. First of all, what’s your motivation in making games? If you’re main motivation is to make money, then you are in the wrong line of business. I can’t count how many people respond to me telling them that I design board games by asking how much money I’m going to make. I think everyone knows the Trivia Pursuit story by now, and ever since then everyone equates board game design with hitting the jackpot. Think of it in terms of authors. For every Stephen King and JK Rowling in the world, there are a million other authors who can’t scrape together a couple of nickels. As a side note I’d like to say that we all do dream of a day where our side interests and hobbies can provide for us financially, but I’m just saying that it shouldn’t be your main motivation. So what is your motivation? For me it’s the need to share my creations with the world; to spread joy and entertainment to as many people as possible! Ah so selfless! That’s the first aspect of Motivation. The second is: how do you stay motivated? It gets challenging some times, especially after a poor play test, to go back to the drawing board and make yet another prototype. My main motivation is my partner, Sen. We’ve been gaming buddies forever and like many of you, decided we could make our own games. At the time we were living quite close to each other and it was easy to meet up to work on our game. We had an idea of making a tile laying game that also had movement, similar to Drakon. We wanted to make a game about finding treasure using treasure maps, but we wanted the treasure hidden in a different location every time you played. We did probably what happens to most people: we came up with a super rough prototype and played it a few times, but came up with some hitches that we couldn’t solve and soon lost interest. Fast forward a couple years and I move half way across the country due to my job. A few months later and my buddy Sen comes out for a visit and we decide we should give this game design thing another shot. Trouble is, now we don’t live down the street from each other. What to do, what to do? We decided to start using a forum. We had a friend set one up for us and we were off to the races. This forum allowed us not only to communicate to each other across the country but also keep track of our thoughts on a variety of games. That was one thing that kept us motivated. The other was the fact that we worked on dozens of ideas at the same time. We have one section of our forum that is called “Brain Farts” and it allows us to jot down any random idea we have that would be interesting in a game. If one of these ideas intrigues both of us then we keep writing more and more about it until it gets promoted to it’s own separate thread. This way if our interest starts to wane on any specific game or topic then we can easily move onto another game. I met a fellow designer who was getting bummed out on his one board game design and he asked me for some advice. I said why not shelve it for awhile and work on some other games, just to keep your interest running high. He indicated that this was his one idea – his one chance to make a lot of money. I told him that I didn’t have any more advice for him. So having the right motivation is important but finding a way to stay motivated is also important. Let’s assume you’re in this for the right reasons (whatever reasons they are), now you just have to find a way (or ways) to keep yourself motivated. How do you stay motivated when designing board games? Step 1: "No one’s going to buy a board game without a board!" Many people get into designing their own board games because they play a lot of board games and think to themselves from time to time that they could make something even better. Other people don’t play that many board games at all, but have stumbled across an idea that they believe is the next Trivia Pursuit. I can’t stress enough how important it is to play games. A lot of games. I went to a game store on an advertised board game night where I came across another board game designer. He had brought his game and he wanted some people to help play test it. I was intrigued and agreed to play the game. I won’t bore you with the details of the game, but you can believe that all the playtesters had some advice for this would-be game designer. My first suggestion was to get rid of the board. There was needless rolling of a die to move around the board when in the end it didn’t really matter. He was outraged at the idea of removing the board game! My initial response to this was referring him to Apples to Apples, which at the time had sold over 3 million copies, and uses just cards and no board whatsoever. He had never heard of it. Now it’s no crime to NOT play every game out there – but you should be familiar with what’s out there. If you’re making a party game – play a lot of party games! If you’re making a strategy game – play strategy games! Of course you can’t play every game (but I do try! ), so instead think of it as researching your competition. Go into game stores and look at games that are targeting the same customers as yours is. Go online (www.boardgamegeek.com) and do the same. Why is this important (besides the anecdotal reason above)? You need to be familiar with game mechanics in other games, themes that are popular (and not popular! ), how many pieces are in the games that are similar to the one you want to make and you need to be familiar with what kind of games each publisher publishes. This last point is important and will be the topic of an upcoming post. So the obvious take away here is to become familiar with what you’re getting into. They say the number one advice for writers is to read a lot, and the same can be said of game designers – play a lot! "I’ve got this idea for a board game…"
If you’ve said this to someone, or even thought this to yourself then this blog is for you. I’m going to take you through the steps on how I got my first couple board games published. First of all, who the heck am I? I’m Jay Cormier, and depending on when you’re reading this I’m either about to be published or I have three games on the market already. I’ll take you through the steps that I went through to get published and if you’re seriously interested in getting your game published then read on.